In one of my posts about the Tween bedroom I'm doing for Mr. One, I asked your expert opinion about how I should refinish his dresser. I already knew what I wanted to do, so I was really just looking for validation from my infallible readers. And you all came through for me. I think it was pretty much a unanimous vote that I should paint the dresser gray. So paint it gray I did. I pulled out the same dove gray color we used for the headboard in our master bedroom (Ralph Lauren's Moonlight) and went to town. I have been wanting a dresser for the other side of the bed to balance it out. Then I remembered that we had a dresser sitting in storage not holding much of anything. So I found other places for the not-much-of-anything stuff, and finished the funny little dresser the same way I finished the first. Because this dresser had horrible rectangular knobs, I went to my local Tar-jay and purchased some great oil-rubbed bronze oval knobs. They really make both dressers look perfect...more tailored. 2. Please link back to the Shabby Nest so others can share in the frugal goodness. 3. Comment, COmMenT, COMMENT! Please show our participants the love! The dressers look great! I love how color unifies furniture in a room! I love the dressers. The knobs are perfect. Thanks for hosting every week. I love the look of those two dressers. Because they're different the room has an eclectic edge though having the same paint colour pulls everything together. Love it. I've been looking to do the same type of thing in my master bedroom though am still on the hunt fo the right pieces of furniture. The dressers are perfectly in sync now. It's all coming together; well done! love the dressers - perfect! they look amazing! Gray was such a fantastic choice. They look perfect in the room. Well done! I LOVE the grey...so calming! Thanks for the inspiration!!! 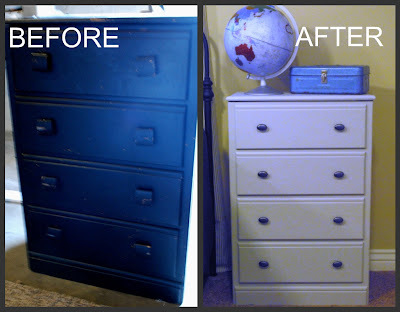 I'm so glad you chose gray for the dressers! It is such a great color for a boy's room. Check out my $1 lamp makeover and thanks for hosting! 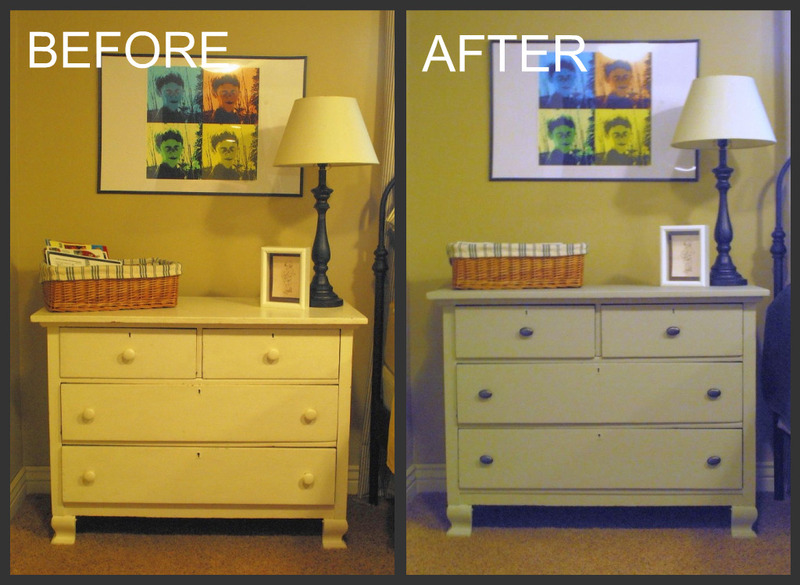 the dressers look so good painted gray. I used those same knobs in my bathrooms. I'm sure your son will be happy with all that storage too! love those dresser redos. which i could find some to redo, i keep looking but coming up empty! Great color choice for your dresser! Loving your blog and linked up to your party! The dressers look great - I can't wait to dive into all of the great ideas! Thanks for hosting. I FINALLY linked up! Yay! :) Have a great weekend Wendy! I love how the little dressers turned out! They look like they were always meant to go together. And the knobs add the perfect touch!